The Curious Orange Cat jumped up on my computer the other day. He said I am not utilizing the affiliate income opportunities out there. (I think secretly he needs new kitty toys.) So, I'm trying something new. Everyone says affiliate marketing is the way to go to help with making money with your blog. I have put this off for sooo long. I feel a little guilty. But then I'm not forcing anyone. So there's the thing. It is easy. See the little Amazon box on the right of my blog? You can click the Amazon logo. If you click that and go into Amazon via my blog and you make a purchase.... I get a little cash. Not a lot. It doesn't cost you any more either. It takes quite a few sales to add up. But then again, who knows. I hate ads all over blogs so I promise this is the only one you will see. So, can you help a girl out and if you can remember...next time. Come here, click my Amazon search and away you go. The Curious Orange Cat thanks you. This will help keep him in kitty toys for sure! So, I got the waistband covered. I broke two size 100 needles to do it. It gets a bit thick along the seam line. 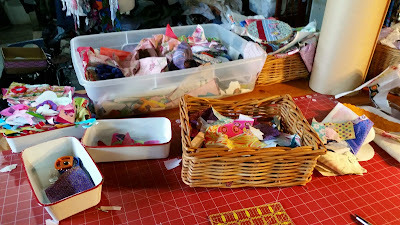 I dropped the feed dogs and used my darning food to messy sew everything on. I sewed the belt loops back on. Not to bad if I say so myself. 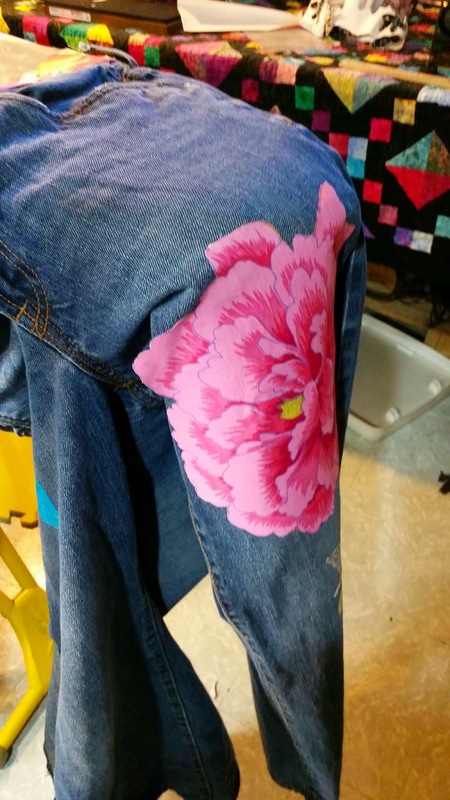 Next I appliquéd the flower and other embellishments. I still had my darning foot on. Here is a picture of the starting point. ...and the finished flower. By the way, big flowers like this one are great ways to learn and practice free form sewing. 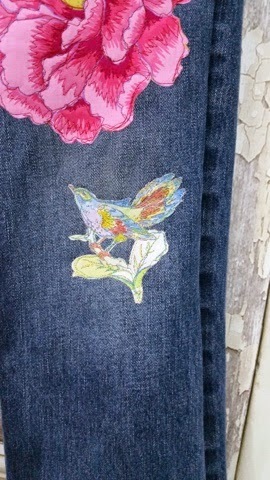 I added a little bird from one of my favorite fabrics. The back needed a little something too. I thought some vines would work nicely. I of course used my Accucut to cut out the vines. I still want to through it in the wash and see if everything holds up. I have a pile of jeans and guess what I'm doing tonight??? Yep, seam ripping the side seams. I have plans for tomorrow! 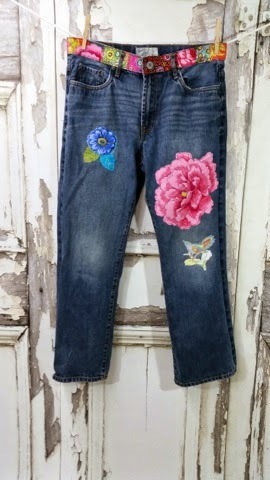 Being a child of the 60's patched blue jeans are nothing new to me. 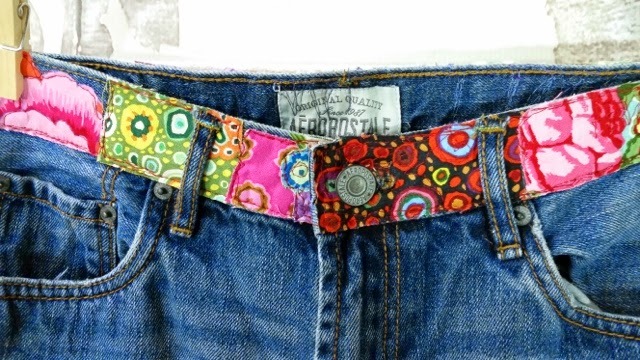 I use to sew all kinds of stuff on my jeans. Crochet flowers were my go to most of the time. Oh, I was soooo cool. Fast forward many years.... I'm needing some new inspiration. 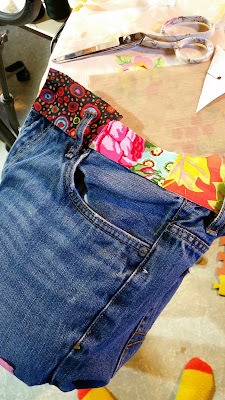 I keep hearing from family and friends that I need to do patchwork jeans. Ok, I get the message! After a bit on Pinterest for inspiration I came up with these. I LOVE the waistband. I couldn't find a good source to credit for the picture. So all I can do is say, check out the thread on Pinterest and maybe you can find the original source. I could not. 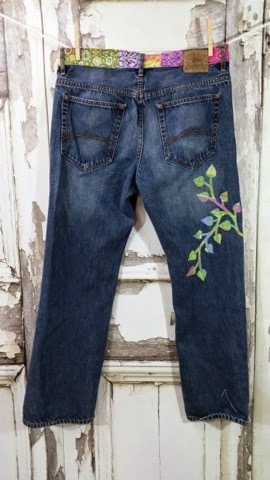 So sorry who ever you are... but your jeans are AWESOME. Boxes and baskets filled with fabrics some with Wonder-under already ironed on, some not. I dump everything out and start looking for cool stuff. I used my seam ripper to cut the outside leg seams. 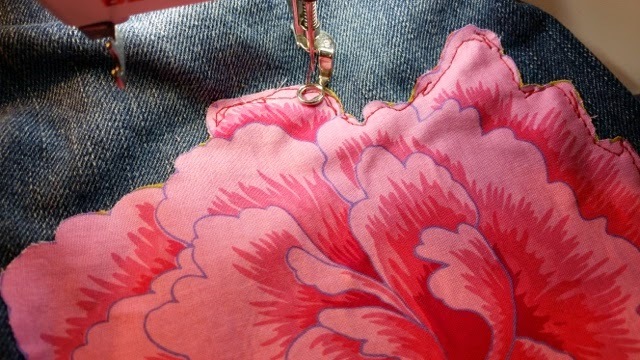 That way I can use my sewing machine to sew everything down and sew it back up again with no one knowing the difference! 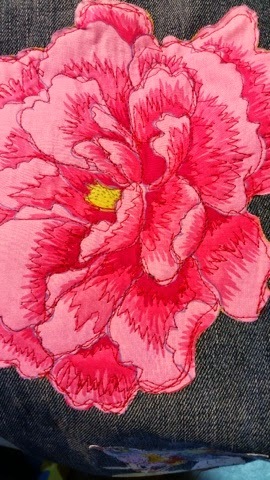 I found this really awesome flower from a Kaffe Fassett fabric I had cut out long time ago. It was so big I just couldn't decide how to use it. These jeans begged me for it. Yes, the clothes do talk to me. They can be so bossy! 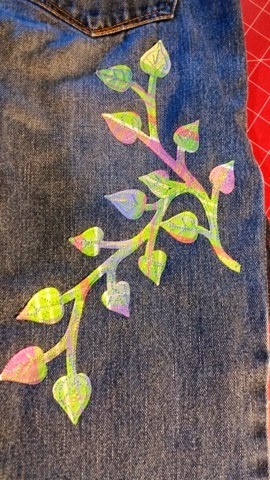 I ironed it on the front of one pant leg. I'm still working on what other things to add. But this is my base inspiration. So I also needed to deal with the waistband. 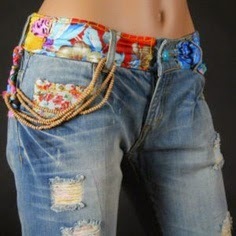 That was my favorite part of the Pinterest jeans. A bit of un-stitching was in order. I needed the belt-loops to get out of the way! So I used my seam ripper to cut the threads on the top part of the belt-loop only. I kept the bottom so I could just sew the top back up without having to try to figure out where it use to be. Now for the fun part. 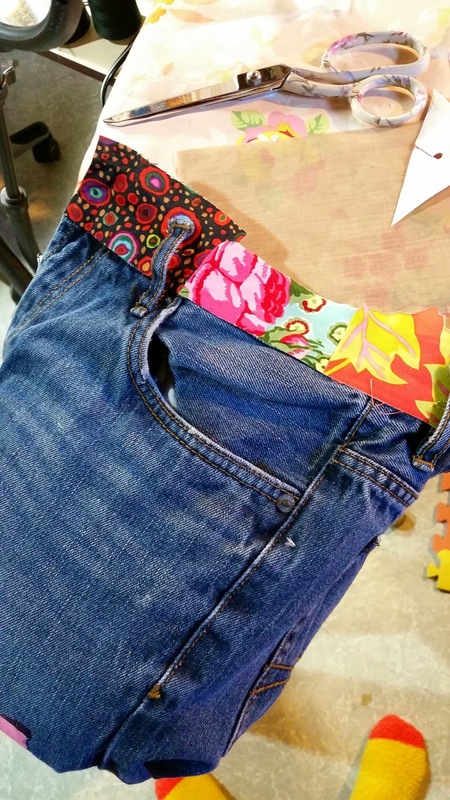 I measured the waistband and cut pieces of fabric a little longer than needed. ( I'll cut it down later. They all had Wonder-under on them so I ironed them down the best I could. Note: I used a Teflon ironing sheet to keep the sticky stuff from getting on my ironing board.